Hi Guys! So the most exciting thing is happening! I’m moving!!! Okay, so I’m staying in the city of Redondo Beach, but this time I’m moving beachside! That’s right, the boyfriend, Dexter and I are all moving next to the water and we’re thrilled! While the boyfriend is excited to be in a 1 minute walking range from his favorite watering hole, Naja’s place, and one of our favorite burger joints, the Standing Room, I’m most excited to be in walking distance to the fresh seafood market at the pier, a whole foods market and my favorite local farmer’s market! I can’t wait to not have to hop in my car to run a few errands! I know this might seem like a small feat, but I look at being able to walk outside and arrive at your destination on foot (in a reasonable amount of time) a luxury…especially living in LA! Anyway, with this crazy move happening during the holidays (terrible timing!) I feel like I barely have time to cook a proper meal. Something I’ve been making big batches of lately, to help save myself on time, is this Shaved Brussels Sprout Salad. I’ll make a batch of it on Monday and eat it multiple times a day through at least Wednesday. If I start to get bored with it I toss in some pepitas, pomegranate seeds or dried cranberries (dried and chopped cantaloupes are pretty amazing in this too!). I’ll also add some quick sauteed garlic shrimp or chicken if I want to bulk it up. It’s such a great go to salad/meal when you’re limited on time. 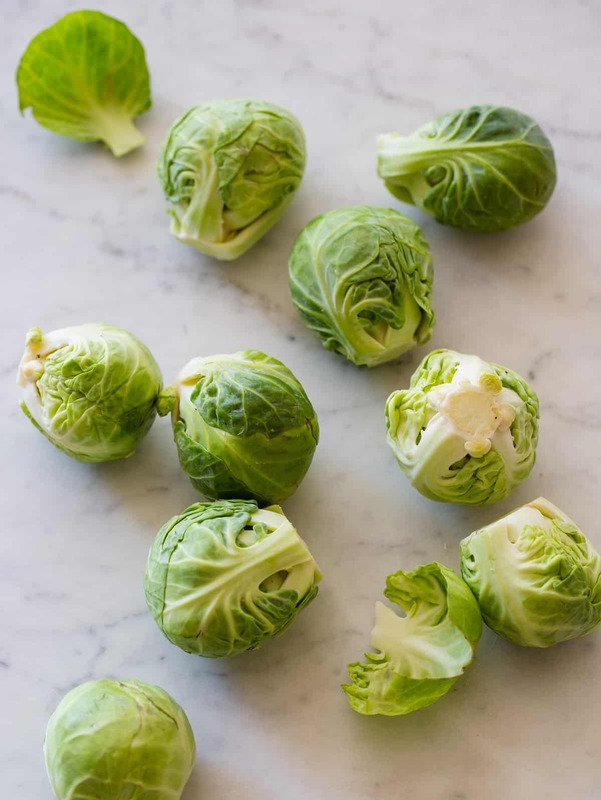 I love it because the brussels sprouts are so hearty that even after it’s tossed together with the vinaigrette, it takes DAYS for the veg to become soggy and I actually like it when the brussels sprouts have been sitting in the vinaigrette for a day or so, the flavors really have a chance to develop. 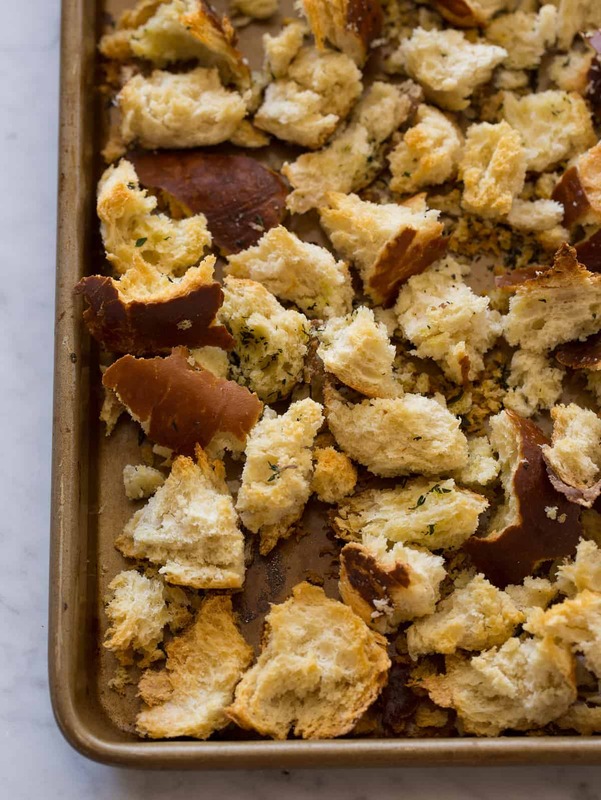 The pretzel croutons also don’t get too soggy like you might expect them to; they definitely soften as time goes on but I kind of like that. 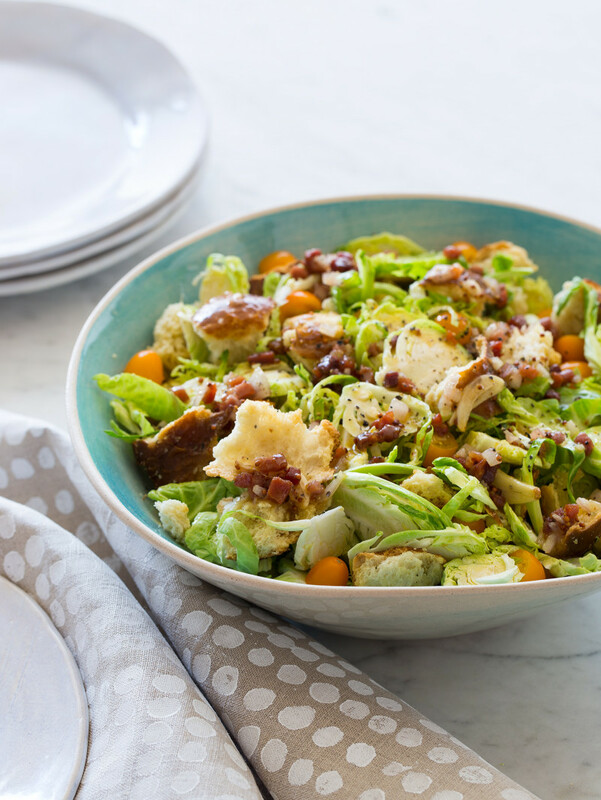 If you’re not into “soft” pretzel bits in your salad, you can always make extra pretzel croutons and refresh your salad with nice, crisp croutons every time you take this salad to the face! 2. For pretzel croutons: Place pretzel pieces and oil into a large mixing bowl and season with salt and pepper. Toss together. Spread onto a baking sheet, in a single layer, and toast for 15 to 20 minutes or until light and crisp. Remove from oven and allow pretzel bits to cool. 3. For vinaigrette: Place a small sauté pan over medium-high heat and melt butter. Add pancetta and sauté for 3 to 4 minutes or until pancetta browns. 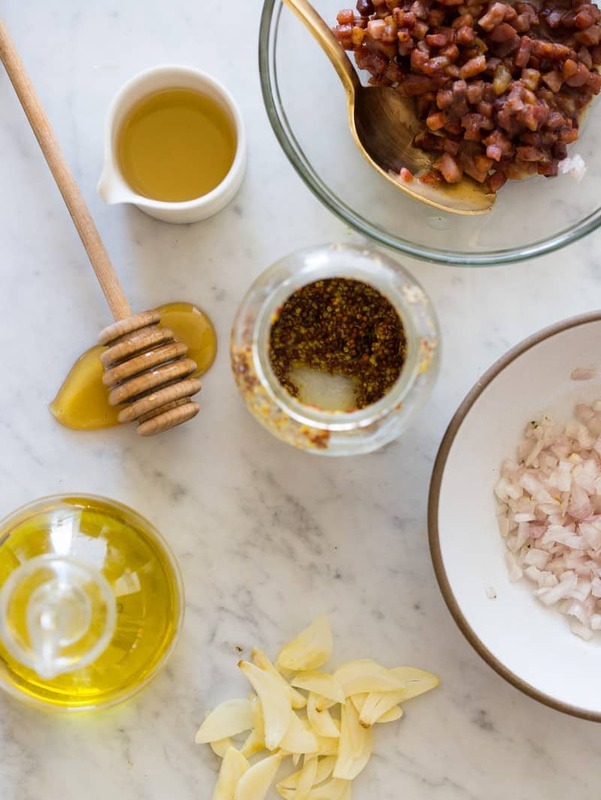 Pour contents into a mixing bowl and add remaining vinaigrette ingredients, except oil. Whisk together and add oil in a slow and steady stream until fully incorporated. Adjust seasonings and set aside until ready to use. 4. 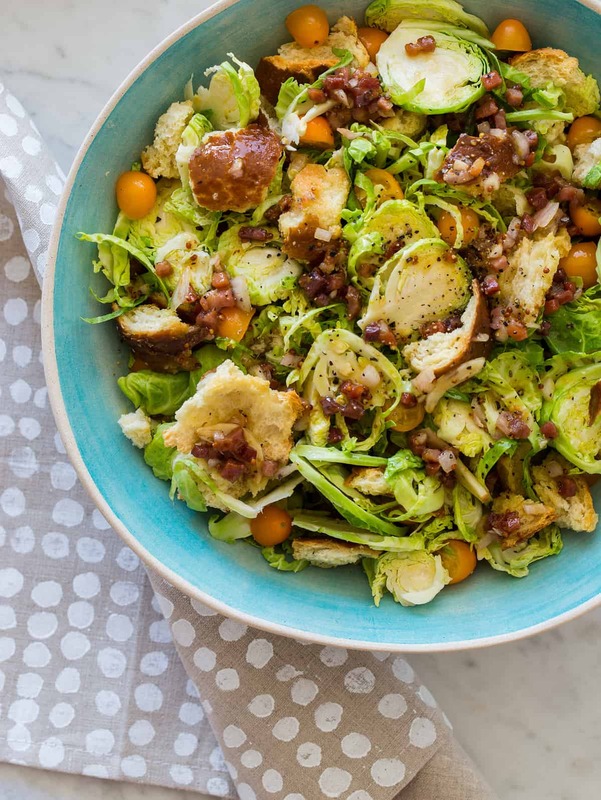 To assemble: Place Brussels sprouts, pretzel croutons, cherry tomatoes and goat cheese (if using) into a large salad bowl and toss together with vinaigrette. Adjust seasonings and allow salad to sit for about 10 minutes before tossing one more time and serving. Adding this to the menu for Thanksgiving! Congratulations on your move!! That’s so exciting… so much work, but so exciting!! Another imaginative recipe, thankyou. I just want to tell you how happy I am that I stumbled across your site a few months ago. It is so inspirational. I am in Edinburgh, Scotland, so no Thanksgiving for us this weekend but I will certainly try these recipes over the holiday. As it is bitterly cold and frosty outside this evening I envy your upcoming beachside lifestyle. Best wishes for this weekend and your move. Um you say whhhat?! A move and a brussel sprouts salad? Get it! Lucky you for being walking distance to Whole Foods, blessing and a curse! I’m all over this! LOVE! This sounds so wonderful! I can hardly wait to try it. So envious of your being able to live on the beach. Do you roast the Brussels sprouts ?? Was thinking this Salad might be excellent with a little roast on the Brussels sprouts for a cold NJ dinner side dish ! This salad looks so delicious – can’t wait to try and make it !! Wonderful recipe! Everyone loved it and wanted the recipe. Made it yesterday for an “early” Thanksgiving dinner. Dressing was awesome! Thank you for a great recipe. It looks awesome and I’m sure it’s deliciou! Hopefully I’ll find some nice brussels sprouts this weekend on the farmers market! If I do, I’ll be having this for dinner this weekend! You had me at “prosciutto mustard vinaigrette.” Awesome. Thanks for sharing! Made this yesterday for Thanksgiving and it was super! I had some family members that I knew would have a hard time with brussels sprouts, but they ate it up like champions! I used feta instead of goat cheese, but other than that I followed it to a T. Great recipe, thanks! This looks TOO good. 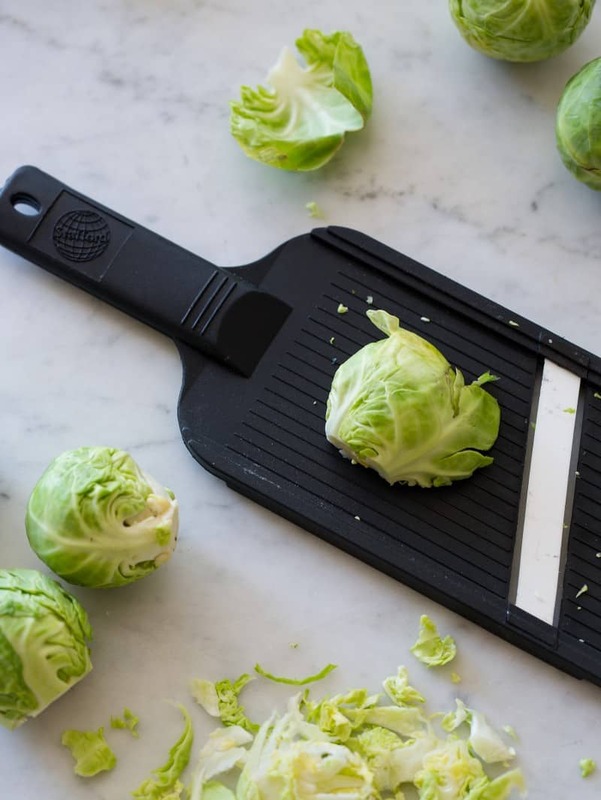 Love Brussels sprouts and I’ve been trying to think of a good fresh salad to do them in instead of roasting — this is definitely a winner. Thanks so much for posting! PS we are neighbors, I live a few blocks from the standing room (YUM!). I made this for dinner last night and it was fabulous! I loved the combination o f flavors and it was simple to put together. I don’t know why, but I never thought to use shaved brussels as a salad, so now that I know how good it is I will definitely be making it again. I plan to make it for Christmas dinner as well – definitely a unique salad that looks just as nice as it tastes. Thanks for sharing this recipe! Lovely recipe. Thank you and good luck moving. Sounds great. Made the salad this Sunday and both me and my hubby are very thankful for the recipe. LOVE this! I will be making this today to be my lunch for the next three days! LOVE this! I’ll be making this salad today for it to be my lunch for the next three days!